Dogs have been a major part of my life and a huge part of our family since I was born (cats too but that’s another story). I remember them well: each was unique and played an important but different role in my life. Corky (an Irish-Setter/Cocker Spaniel) was my childhood Lassie and saved my life when I was three years old and attempting to cross highway 1 in Carmel behind our house. As a child I looked up to her like a third parent for strength, love and protection — and she fulfilled the role. She was smart, loving and watchful; she died when I was 10 and it was a huge lost. The six family dogs that spanned most of my life were the Marley’s for me: Soda Pop, Buffy, Chelsea, Chester, Brashly and Jack. Each different and unique in their own way within the arc of our lives. Soda was our family dog from grade school to college; Buffy during college until I got married; Chelsea was my wife’s dog and was there during our romance, marriage and children’s birth; Chester, Brashly and Jack as our children grew up and left home. They brought joy, love, and comfort through the years as they passed in and out of our lives, marking the passing of time. We remember their lives as deep memories: the joys of a new puppy, playing with an obedient companion, and the devotion of a faithful old dog. From them I learned the meaning of life and death, love and loyalty, what companionship really meant. However, at least for most of my life, as important as they were they were just dogs. Important yes, but not rising to the level of anything else. Then, much to my surprise, in my 50s, I had a Hatchi experience: an unexpected gift at a point in my life where I thought I had moved past dogs emotionally. Even now it’s hard to describe the power of a dedicated and loving dog at that stage in my life. Bandit’s short life had a profound effect on me and fundamentally changed my preconceptions of dogs. We connected in a way I didn’t know was possible at a time in my life when I thought I had it all: a loving wife; two wonderful, close children; and a successful career. Bandit surprised me by how much I still had a place in my heart for the simple love of a dog. And his accidental death hit me hard. Right to my heart. But Bandit led to Baxter, my current companion. And everyday I marvel at our simple but deep connection. He reads my moods and understands when it’s time to play, to rest, to leave me alone while I work. He responds to a wink and a nod, a turn of the head, a familiar gesture or sound. He keeps me warm when I sleep and dishes out love at unexpected times — often just when I need it. And now, looking back on all of the love, devotion and wisdom I have received from dogs over the course of my life, it makes me wonder about the deeper meaning of it all. Maybe it is just the love of a devoted pet. But I can’t help but feel it is more — perhaps much more. Our dogs throw their lives in with ours. No holding back. No options for anything else. They commit to us, unequivocally, and even under the worst of circumstances dogs just want to love and be loved. They are forgiving, always happy to see us. We bring them into our homes and we treat them like family, sometimes better than family, and we love them without reservation and they love us right back. Don’t you feel their souls? Don’t you wonder what your dog is imagining while he twitches while dreaming? Isn’t there a spark there that you recognize as a kin of sorts, a fellow being? Not a human but yet something still special? They anticipate our next moves, understand our routines, and recognize our idiosyncratic ways as individuals. They know they are unique and clearly know who we are but do we know them? So here’s the rub: dogs are wolves. All dog breeds have their origins in grey wolves and are 99% genetically similar. All of them. Those wild, highly feared and reviled creatures that lurk in the wilderness. The animals where our first response is generally to shoot on sight, no questions asked. Largely due to myths and legends, these close relatives of dogs spark intense emotions and thus our fear and hatred of wolves, or at least of the evil they symbolize, runs deep. So why the big difference: dog vs. wolves? 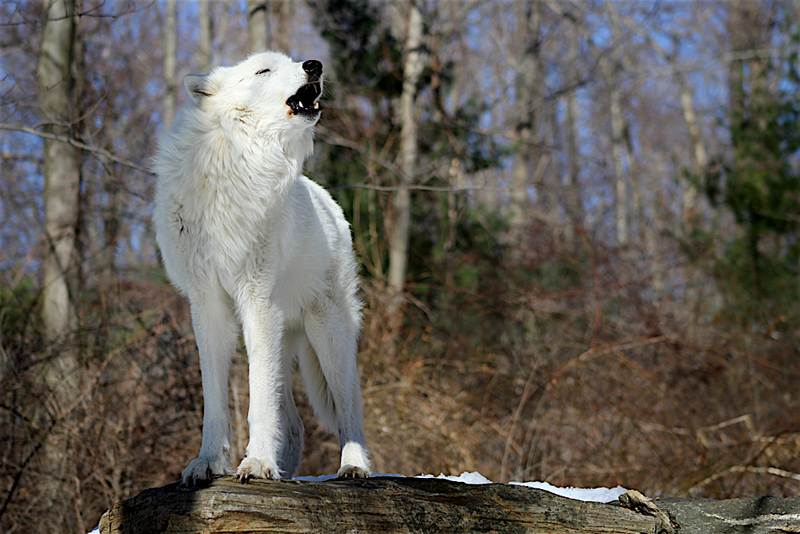 Of course wolves are different — dogs are highly domesticated animals while wolves are wild animals — but the reality is, which is backed up by evidence, wolves do not represent a significant threat to us. Unprovoked attacks by wolves on humans are extremely rare. The truth is a person in wolf country has a greater chance of being killed by a dog, lightning, a bee sting or a car collision with a deer than being injured by a wolf. Moreover, wolves are an important component of natural ecosystems and their presence is essential for healthy forests and wildlife. Yet, we kill them on sight. Things we would never imagine with our dogs. Why the big difference? I think it’s perspective. Domestic dogs evolved from gray wolves that learned to benefit for their interactions with humans. Over time they learned to relax their aggression towards us which gave us the opportunity to have a relationship whereby we learned to trust them. In other words, domestic dogs have allowed us to know them in the way that wolves might see each other, as kin. But those that have spent time with wolves also say they are peaceful warriors (Safina, 2015). The biggest difference of course, is that they are wild animals, not adapted to living with us. Pure and free creatures of the earth, just like us, and as long as we stay out of their way, and keep our interests away from their’s, they are harmless. Clearly, we have the capacity to love wild animals when given the chance: we know this for elephants, lions, orcas, the stories are endless and convincing (see Balcombe, 2010; Safina, 2015). So one lesson here is that it just takes time to get to know a “non-human.” The animals we know best are the ones we live with the most, our pets. But yet we are inexorably drawn to the wilderness and have a need to form emotional connections with living creatures. But given our higher intellect and technology we should be able to distinguish our primal fear of animals from our ethically-rich intellectual future. We are simply smarter than that, and our better understanding of animals in recent times has outpaced our cultural, ethical and legal views towards animals, which was formed in an earlier time. It’s been called the signature cry of all humanity: “I am not an animal.” Over thousands of years, we humans have sought to separate ourselves from the rest of nature, to see ourselves as superior and “exceptional”. We don’t even like to be reminded of the fact that we are animals. They are animals, we are humans. But the more we try to separate ourselves from nature, the more we inevitably alienate ourselves from our own nature. This denial of our own nature, coupled with our ability to do great damage to the Earth, is the recipe for the growing catastrophe that’s overtaking our world. Typically, our belief systems reinforce this symbolic self by saying, for example, that “animals” (meaning nonhuman animals) don’t have a soul. Whether or not these claims have any basis in truth, we use them to proclaim that “I am not an animal” and to separate ourselves, at least in our own minds, from the other animals and from our own true nature. The end result is an entirely dysfunctional relationship to our fellow creatures and to the planet that’s our home and our environment. The truth is that we are part of all living things on this planet. We are all connected. We just need to start living our lives in a way that honors those connections. Balcombe, J. 2010. Second Nature: the Inner Lives of Animals. McMillan press. The Elephant in the Living Room, a film by Michael Webber. Takes viewers on a journey inside the controversial subculture of raising the most dangerous animals in the world, as household pets. Safina, Carl. 2015. Beyond Words: What Animals Think and Feel. Henry Holt and Co.
Wow, what a FANTASTIC piece, Brian. Truly amazing – you have captured it all – love of dogs, our connection to nature and the opportunity to be better mammals…. Happy New Year from our animal family to yours!!!! Thanks Barb, I appreciate the comments and love your blog too. It’s the best!